Melbourne’s bus and tram networks have one thing in common – they get delayed by single occupant cars. Dedicated lanes are one way to keep public transport moving, but what happens when there is not enough road space for both? An interesting setup can be found on Queensbridge Street in Southbank – trams and buses share the concrete covered tracks that run along the centre of the road, away from pesky cars. In addition buses and trams share a stop outside Crown Casino, allowing intending passengers to flag down whatever vehicle is next to arrive. A similar intermodal transfer facility can be found at the Clifton Hill interchange, where route 86 trams share the centre of Queens Parade with a number of different bus routes. It raises the question – why doesn’t this appear more often in Melbourne? Tram tracks in Melbourne can be broken into three categories – part of the road pavement, separate ROW with tracks laid in mass concrete, separate ROW with tracks mounted on sleepers on ballast. The first two of these categories can support bus operations, ballasted track requires relaying in mass concrete at significant cost. pose a hazard for buses. This setup is found on much of the reserved track in Melbourne. The issue is one of horizontal clearances – although the trams are slightly wider (around 150mm) than buses, they have the advantage of a fixed guidance system. the high level of the platforms (around 300mm compared to standard 150mm kerb) causes problems as the buses are designed to load wheelchairs from standard height kerb (through kneeling). Horizontal clearances also pose a potential problem for buses using existing tram stops. 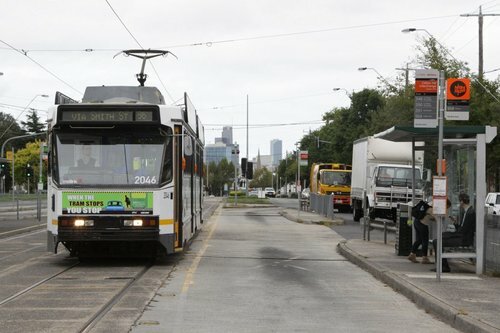 Although buses are marginally narrower than the trams in use in Melbourne, manual guidance by drivers is not as precise as track guidance for trams. Introducing buses to existing light rail infrastructure changes the maintenance requirements for that infrastructure. The institutional framework and particularly the system of payments to public transport operators in Melbourne complicates this, by emphasising the importance of determining who is responsible for cost of maintenance or repairs, both scheduled and emergency. point reinforces that only authorised vehicles may use the tram ROW. A recurrent issue in the stakeholder interviews was a feeling that car drivers view buses as a part of mixed traffic – this makes delineation of tram lanes critical for any application of joint operations. Cars mistakenly or deliberately following buses into tram lanes will lead to delays to public transport and an increased risk of collisions. The paper also mentions the current operating rules relating to the shared tram-bus lane on Queensbridge Street. There are also rules which detail safe following distances, interestingly the bus operator did not have these to hand, indicating perhaps that this operating regime was necessary to have joint operations approved and is not so important in day to day operations. The paper acknowledges that Melbourne’s buses are treated as third-class citizens. Traditionally the attitude of those involved in public transport in Melbourne has been to view the modes as separate, with buses and trams being potential competitors. This is being partly addressed through attention being focussed on integrated transport solutions, however the contractual framework and institutional structures act as a brake on this attitude change. Shiny new stickers will never fix that problem! A recent example of a failure to take account of buses in tram infrastructure design is the Exhibition Street extension. The Department of Infrastructure noted that during the construction phase, the rerouting of Bus 605 down the tram right of way was investigated and found unfeasible due to incompatible infrastructure. Proposals for joint operations as part of both the Box Hill and Vermont South tram extensions were floated but not pursued. In May 2015 the tram tracks on Queensbridge Street were rebuilt, with a new platform stop built outside Crown Casino. Trams have no trouble using it. Which proves that there aren’t any technical reasons shared tram-bus lanes could not be created elsewhere in Melbourne. Yeah, but, generally you don’t want trams and buses on the same stretch of road, or you are essentially duplicating service along that road. If they share a bus stop, it is pretty much only until they can branch off from each other. You don’t want bus routes following train or tram, it’s a waste, and the only time you’ll do it is for convenience in the city where you want to avoid having to force people to change from bus to tram. It’s still rare, and mostly a non-issue. As much as possible you should avoid using buses, they are there to link into the network areas that are too far from transit. Melbourne’s network is too full of meandering bus services, that are too far apart, and just cost way too much. We should be taking the buses off the backroads and shoving them down dedicated bus lanes on main roads. This is happening a little, but it’s taking too long. Most of the network suffers from these issues, bus routes that are stupid and designed by a moron. Route 82 and the parallel bus routes out of Footscray are a good example of this – route 472 even heads all the way to Moonee Ponds, but via a different part of Ascot Vale. There are also a number of bus routes linking Footscray station to Highpoint Shopping Centre – most of them follow the tram, but the departure points scattered over a half-dozen streets in Footscray! I presume ROW stands for right of way? 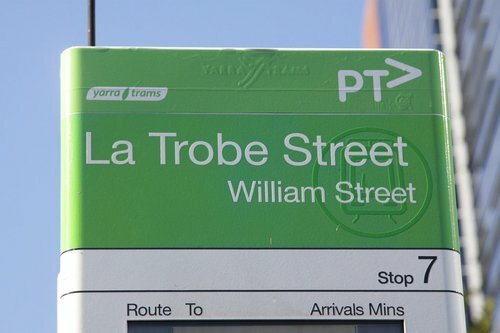 And pretty poor job on the PTV re-branding of the tram stop :/. Yes: ROW = Right of Way. In Germany they used to have O-Bahn buses sharing tracks with trams. I wonder how hard it would be to design a guided bus that uses tram tracks instead of kerbs? That would take care of the problem of centre poles and safety zones. And I’m sure a kneeling mechanism could be designed with a slightly longer travel so it could raise the floor to 300mm so the bus could use superstops designed for trams. The gap due to the narrow body would be less than on a Z-class tram. The gap between Z class trams and platform stops used to be a concern back in the days when only the St Kilda and Port Melbourne light rail lines had them, but since the wider deployment of the stops, Yarra Trams seems to have stopped caring. While I agree bus and tram services should not duplicate each other, it’s impossible to design the network feasibly so that buses and trams never share a single stretch of road. Interesting article. Some other examples of buses using tram rights of way are peak only tram lanes. One example I witness regularly is Doncaster Rd inbound between Bulleen and Burke Rds in the morning peak. The traffic in the left lane banks back very far, while buses are able to use the centre lane with trams. Unfortunately, the setup is not ideal, as buses must push back into the clogged left lane to collect passengers at kerbside stops. I’ve seen instances where the bus has simply not bothered to get over to the kerb all the way, and just opened the doors while in the centre lane. The question you should be asking, is why are buses and trams sharing the same space? Obviously, the reason is that we have buses inside the city, and then you should be asking why we have buses in the city, in a city with one of the greatest criss cross tram networks you are going to find. We have so many trams in the city, they wanted to stick a train tunnel under the city, because they may as well connect themselves up one by one to give the damned drivers a 10 minute nap, bang, Swanston street done. Why do we have buses in the city? I already know the answer, and that is because our city is full of people who think it’s their god given right to never have to transfer between services, and then the damned stations around the city are just too damn far to walk to. It’s insane, we have trains and trams running into the city, the buses shouldn’t go to the city, they should connect up to a rail station, and if needed run more tram lines, or more trains, build more train lines metro style into the city, but, these buses are a waste of everything. That’s your answer, do we really need like 10+ bus routes from the Doncaster area flying down the freeway into the city? If you need to start thinking about placing guides on the buses to allow them to sit on the tram lines, well, I’ve got better answers. Buses are one of the most misused public transport devices ever. The routes designed over time to pork barrel one thing or another. They meander, and they are slow, they take way too much time, and this leads them to costing too much, and then services suffer in the long run. Buses should be all converted to major smart bus routes that go down main roads, and if you can’t get to a main road, you need to get off the couch and learn to walk. Once you move all the buses off their current meandering routes and onto main roads that go around the city, radial style, and feed into stations. Then you’ll have buses every 15 minutes. Here’s the thing, take a look at every 2 out of 3 routes, and you’ll see the same thing, the routes are dumb, there is over-service on some loop style routes that run every 30 minutes with a maximum of 2 – 3 passengers, bus driver has a 10 minute break, has to pull over by the side of the road because the 30 minutes allotted is so over the top that he’d have to roll down the road at a casual 40km/h not to end up early. Then you have routes that are crazy, like, the start and end of a route. One thing I have noticed, is why the start and end of a route runs back over the same road? Why not chuck a bit of a one way loop at the ends, because let’s be honest, it’s pointless covering the same bit of road. Routes which have deviations that make no sense. Epping plaza and Northern hospital where two bus stops are so close together, that it makes no sense to keep them both open. To top off my list of complaints, bus lanes with dedicated B symbols at the lights, which more often then not actually hold the bus up. For example, route 902 at Thomastown heading towards Keon park has this giant bus lane on the left, and so many times, the bus could have easily made the lights if it just moved over two lanes and rounded the corner, instead, it ends up sitting on the left waiting and waiting for a couple of minutes just to unnecessarily hold up traffic at the intersection letting a single bus turn the corner. You’ve got this stupid bus lane on Cooper St north which also does nothing but slow the bus down, the poor bus gets a red B whilst through traffic gets green all the way, and then the bus lane ends 50 meters up the road anyways, and you can’t say this is temporary, they just upgraded this road, this is how the road was designed, it is piss poor. Buses are stupid welfare devices, you’d never run half these routes the way they are run, if they had to stand on their own merits and make a profit. Which kind of makes me understand why bus drives don’t care about your Myki card, it’s like, yeah yeah, whatever, got a timetable to stick to. I’m sorry, but I completely disagree with what you have said here. I suggest you ride the Doncaster routes before you start suggesting they do not run to the city. Catching the DART routes are an order of magnitude faster than catching a feeder bus to a nearby railway station and getting the train. Alas, for much of Manningham and northern Boroondara, there is no nearby railway station. Do you propose people on Belmore Road backtrack away from the city, and get a bus all the way to Box Hill, just so we don’t get buses going down the freeway into the city? Also, while your assumptions about buses are usually correct, they’re wrong in this case. The Doncaster routes are regularly full. For example, routes 200 and 207, which operate at a 7.5min frequency peak and 10 minute frequency off-peak, are basically always full, no matter what time of the day, as they travel into the city. Also, my example about buses and trams sharing space is in the middle suburbs, not in the inner suburbs or CBD where you’re proposing removing buses. The Doncaster buses should not be going into the city, patronage has reached train levels. A train line should be run to Doncaster, and then buses should feed to station not city. It might be ok for the infrequent 55 tram to share a short length of track with buses but I think buses would end up delaying trams where tram services were more frequent. The roof of the old Domain Interchange was taken out by a bus using the tram tracks and a bus also took off part of the roof of the old Batman Avenue tram shelter/signal box. Domain Interchange in peak is already busy enough with wave after wave of trams filling the platforms – buses sharing the tracks there won’t really work. I have no problem with buses using tram track space where they happen to be using the same bit of road – though where there is a tram platform, of the bus cant use it, then no good. If the problem could be dealt with, then for instance the doncaster buses could maybe use nicholson street instead of only sometimes bus only lane in Victoria / Hodle and might even get to the freeway faster. Yes big missed opportunity that the buses (frequent ones anyway) arnt integrated with trams – I love tram tracker, but why doesnt it include at least some buses too ? Im near teh intersection of Johnston and Nicolson Streets in Fitzroy, be good if the tracker app gave me the bus option (often faster and maybe going where I want to go) as well as the tram. The busses at Clifton Hill used to be able to use the tram tracks through to when they turn right at Westgarth St, but after the construction of the platform stop over the Merri Creek they now have to detour back into the traffic lanes to get around it. I always wondered why this was not done more but of course this operation was set up in the days when these routes were tramway buses. In those days the tramway buses shared a vehicle monitoring system with the trams, so for them a TramTracker style system would have been possible, I presume these days that is not the case. The links between trams and buses sharing road space and the old MMTB tramways buses is one I missed – it was a common factor!